I have waited so long for this bracelet, when we went to see Britney in August 2018 my auntie picked this up for me. 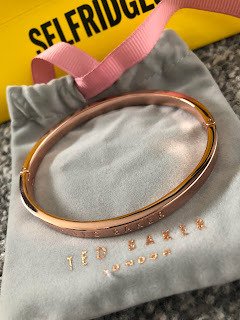 I had been on the hunt for one of these rose gold Ted Baker bracelets for quite a while so I knew there was no way we were leaving without it, and my auntie ended up treating me to it. Now this gift from my auntie and uncle I really wasn't expecting, especially after the Ted Baker bracelet. 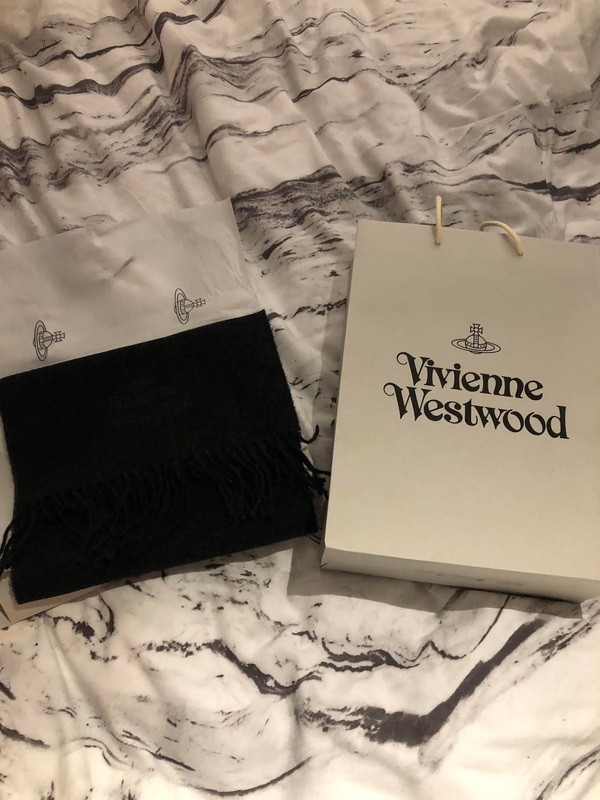 I have been on the look out for a really nice quality scarf for such a long time, especially one that isn't too in your face and is really subtle and soft and this amazing Vivienne Westwood one really ticks all of the boxes. This scarf is so comfortable and I really can't wait for more opportunities to wear this. There is a long standing joke in my family that I have really short arms, this has meant I have ended up with the nickname T-Rex. 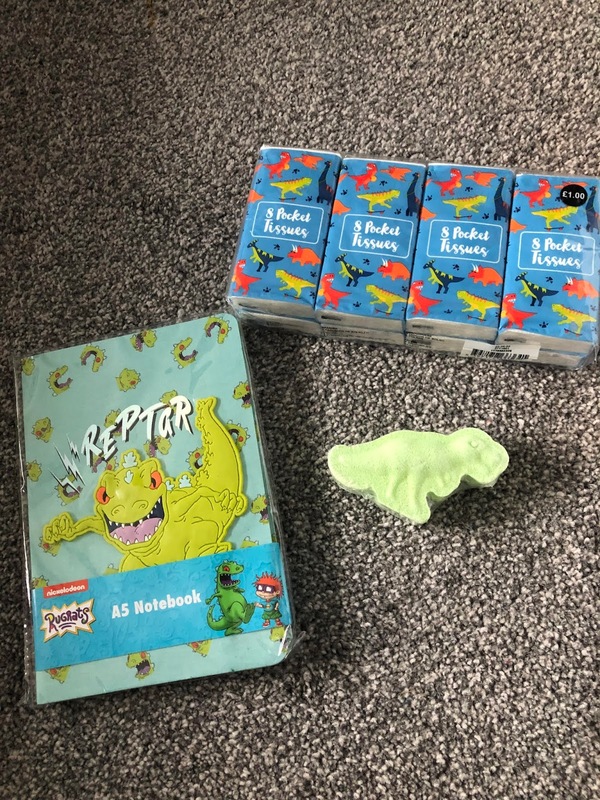 So it was obvious there was going to be plenty of dinosaur related items. I got a pack of dinosaur tissues, which are forever coming in handy especially with the colds I keep getting. I also got this watermelon T-Rex bath bomb which looks almost too cute to use but it smells gorgeous. I also got the Reptar Rugrats notebook just to fit into the dinosaur theme plus growing up I was always obsessed with the Rugrats, I would watch that show religiously, in fact I still would if I could. 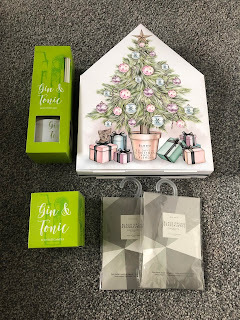 I am so glad we got a few bits for the house too, just a few days before Christmas our Aldi diffuser run out so I was so happy to receive this gin & tonic one, although I think I am going to wait for the dressing room to be finished to get cracking on with this. We also got a matching candle which will go perfect in that little room. I also got a 25 day candle advent calendar which has a brilliant selection of candles in it, which I can tell will be getting dotted all over the house getting it smelling even nicer than the Aldi room sprays currently have it smelling. 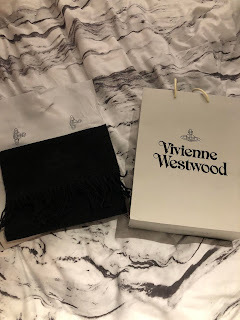 I also got a couple of these room sachets from Primark which have become something I love having around in the wardrobe and my clothing drawers as they just keep everything smelling nice and fresh. In part one you will have seen I got a grey puffer jacket, but that wasn't the only jacket I got.. 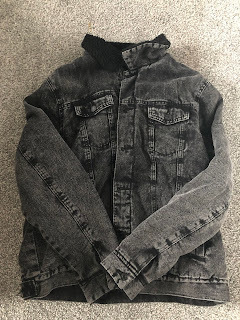 I finally have my dark denim jacket and it fits absolutely brilliantly for a change. 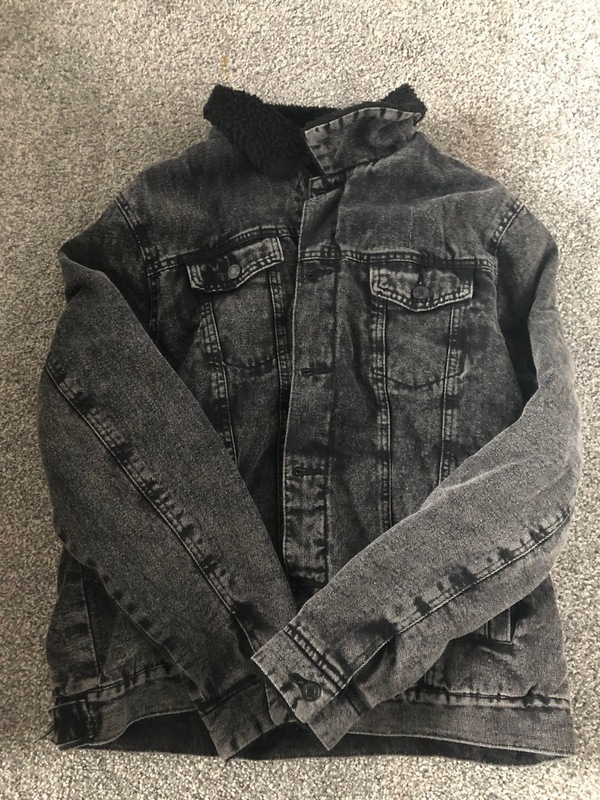 The arms are the perfect length and it is so warm, I can so me wearing this a lot especially as the weather warms up a little. I love how the collar is wool when it is actually folded down as this just adds to the jacket. I am so glad I have finally got one. Is it Christmas if you don't get novelty socks? I got these cute Minnie Mouse footlets which are perfect for if I am just relaxing in the house. 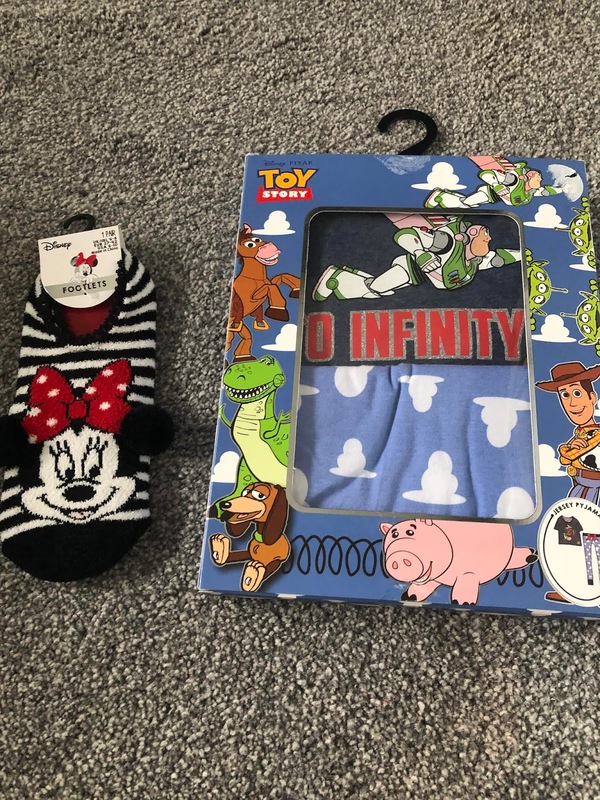 I also got these Toy Story pyjamas as Toy Story is one of my all time favourite films and Buzz is one of my favourite characters from in the film (roll on Toy Story 4). I was really lucky with what I got from my little sister too, she got me another cute Stitch figure to add to my collection (we really need a new shelf for these) she also got me and Liam some gin and mixers and even a where is Michael Jackson book. We also got a where is Donald Trump book from Liam's dad so these will keep us entertained. From Liam's side of the family we also got plenty of alcohol which after how ill I have been I really can't wait to tuck into. Liam's mum also got us a super cute Joker fairy door which looks amazing in our living room. 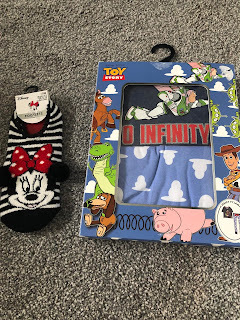 Again I am so grateful for everything I have received this year I wasn't expecting even half as much as this so I have been well and truly spoilt. I now can't wait for next Christmas when the Nephew is finally here.